Summary: We will to install semi-permanent acoustic receivers and tag 10 juvenile green turtles (Chelonia mydas) from the nearshore reef in Brevard County to provide answers to questions concerning sea turtle movements along the east coast of Florida; specifically, are juvenile green turtles relatively long-term residents of the nearshore hardbottom habitat in Brevard County or are these animals transient (frequently moving between habitat-types)?, or do turtle movement patterns more closely correlate with seasonal or stochastic events? 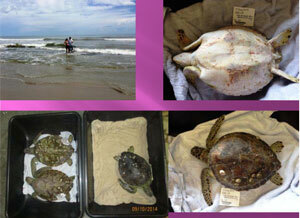 The objective of this study is to determine the function of nearshore hardbottom habitat for juvenile green turtles. The current Florida Atlantic Coast Telemetry (or FACT) Array is a collaboration of agencies maintaining 164 compatible acoustic receivers to obtain tracking patterns and movement detections of animals over long distances. The array spans 300 km from Daytona Beach to Delray Beach in inland, nearshore, and offshore waters. Currently, significant gaps in the nearshore and offshore exist in central sections of the Array. In becoming a participant member of the FACT Array, we will broaden the knowledge base of juvenile sea turtle movements along the east coast of Florida in areas and assist management with current challenges in managing and regulating sensitive shoreline habitats. Results: The results of tracking during this grant period indicate that juvenile green turtles ranging in size from 23.0 to 33.0 cm straight carapace length utilize the nearshore reefs in shallow waters (sometimes <0.5m deep), for at least one month. The recapture of turtles that had lost their acoustic tags and other recapture data from turtles that were only flipper or PIT tagged indicate turtles likely stay within the area for a year or more. The minimum period of tracking data was 1 day and the maximum was 117 days. Only one turtle was detected outside the Mid-Reach array at Sebastian Inlet receiver. The turtle was recaptured within 2 weeks in the same area where it was originally captured and its tag was missing. Except this one turtle that was detected briefly outside the Mid-Reach array, none of the other tagged turtles were detected at nearby receivers, and turtles from other study area populations were not detected within the Mid-Reach array. Most of the turtles were detected at two of more receivers, however, the relatively large number of recaptures of turtles within a distance of <100m from their original capture location indicate that many exhibit high site fidelity. It is likely that turtles remained adjacent to or near the hardbottom habitat for foraging and shelter.